When it comes to reading, my son is a fantasy-loving geek like his mama. During our quiet reading time, right before bed, he’ll reach for Percy Jackson or Harry Potter or The Hobbit. But, as I’ve mentioned before, the kids don’t have required reading lists at school. It’s as though everyone is so excited the kids are reading, that no one’s concentrating on what they’re reading (at least in our case. I have talked to teachers at other schools — including some of you! — who do have some excellent reading lists for your classes). I think we’re missing something vital in that, especially in terms of making history relatable to kids. It is one thing to learn about the Nazi occupation of European countries from a textbook. It is quite another to experience it from the point of view of a 13-year old Jewish girl living in Amsterdam at the time. So when we went to read the other night, and my eleven-year old came down holding Number the Stars, I got really excited. Him: “Meh.” And he wandered off to re-read The Lightning Thief for the twelve hundredth time. And so, although he’s been reading on his own before bed for years now, I’ve begun reading out loud to my oldest boy again. 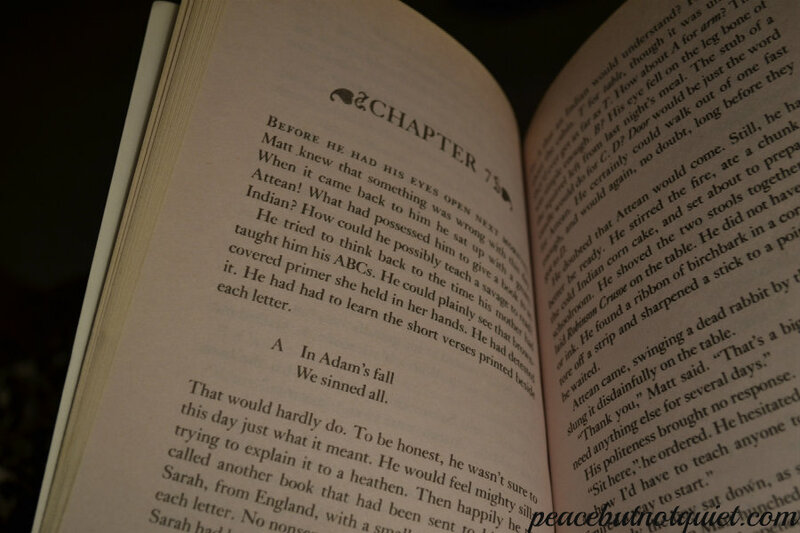 And when we get to the end of a chapter, he asks for another. And now we’re halfway done with the book he refused to read. I caught him cheating and reading ahead last night. My daughter, who rejected The Secret Garden (honestly! Who rejects The Secret Garden?!) has been sitting while I read that one out loud to her as well. It’s a great way to broaden their horizons and introduce new books…and maybe it’s because I know I won’t be able to do this forever that it’s one of my favorite times of day now. What’s your favorite book to read with your kids? Thank you for visiting Peace but Not Quiet! I’d love it if you’d take a minute to like me on facebook and follow me on twitter. 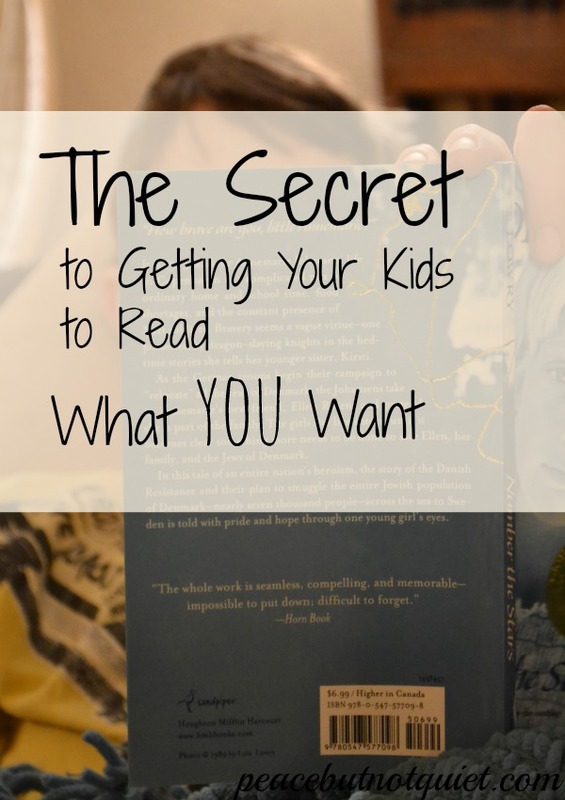 It’s funny you posted about this because I have recently discovered this “trick” to get my kids interested in different books besides Diary of a Wimpy kid. I realized it after I went to read to my son’s class one day. He was thrilled to have me read to them and then wanted me to do it at home more. Now I read more often to both of my boys at home and really enjoy that special bonding time!